82 LISTS The Life of an ActorLists of fun facts, fascinating trivia, and wild, charming, and even heartbreaking stories about some of the most famous people you feel like you already know. Who is Jason Bourne, really? Matt Damon weaseled his way into the popular consciousness alongside best friend Ben Affleck when the duo nabbed an Academy Award for Best Screenplay in 1998. Since then, Damon, with more than 70 acting credits, has become one of Hollywood’s most bankable stars. However, Damon maintains he’s an average guy, and makes every attempt to keep his private life as private as possible. That said, information sometimes leaks through the cracks, hence these little known Matt Damon facts. This list contains a few fascinating Matt Damon stories from before he was famous. Indeed, some of the most obscure Matt Damon facts relate to his childhood. Were you aware he spent a few years in a commune in Boston? Did you know he attended and "fake graduated" from one of the most prestigious Ivy League schools in the country? Did you know Ben and Matt are more than just old friends? Read about Matt Damon before fame and after. You'll learn why he selects certain movies to star in over others. Let us know which true Matt Damon stories you loved learning about the most in the comments section below. Matt Damon and fellow Boston native Ben Affleck are more than just childhood friends. According to the New England Genealogical Society, the Good Will Hunting Oscar winning screenwriters and co-stars are tenth cousins, once removed. Both are descended from William Knowlton Jr., a bricklayer who made his way to the United States from England in the 1630s. Okay, so Matt Damon isn't perfect. He and Good Will Hunting love interest Minnie Driver began a real romance while the film was in production. When the picture received nine Academy Award nominations, Damon hit the awards circuit. On The Oprah Winfrey Show, he denied he had a girlfriend. This was a surprise to Driver, who thought they were still a couple. "It's horrendous breaking up with someone anyway, but to have it be so public and to be cast in a role that I would never play if they were paying me - this wronged woman," Driver stated during a 1998 interview with the Los Angeles Times. "It's unfortunate that Matt went on 'Oprah'; it seemed like a good forum for him to announce to the world that we were no longer together, which I found fantastically inappropriate. Of course, he was busy declaring his love for me on David Letterman a month previously." Damon lost 40 pounds with extreme diet and exercise for the role of Specialist Ilario in Courage Under Fire (1996). His character, a solder experiencing the devastating after effects of war, becomes addicted to heroin. Damon's health suffered from the weight loss; he had to take medication for a year and a half to correct the stress he put on his adrenal gland. Despite the trauma, it was worth it in the end. Matt's commitment and method style of acting caught the eye of Francis Ford Coppola, who cast the actor in the lead role of his 1997 legal drama The Rainmaker. Matt’s brother Kyle visited a physicist on the MIT campus one day. 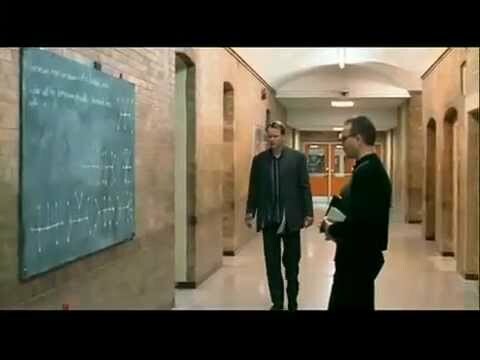 While walking down the school's Infinite Corridor, which is lined with blackboards, Kyle, an artist, picked up a piece of a chalk and wrote an elaborate, totally fake, equation.